Patriarch Sviatoslav addressed to Cardinal Christoph Schönborn , Archbishop of Vienna , Ordinary for the faithful of the Byzantine rite, on the occasion of the symposium " What does it mean today to be a Christian? Basing on the experience of the martyrdom of Eastern Churches , "which takes place in Vienna (Austria) on November the 9th . 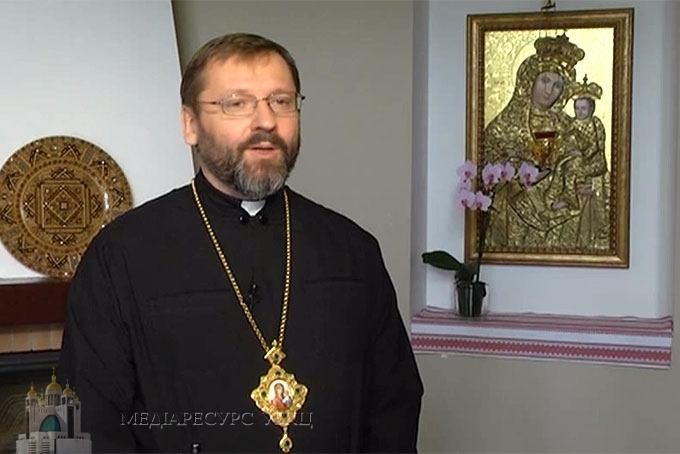 Bishop Bohdan ( Dziurakh ), the Secretary of the Synod of Bishops, who represented our church at the event, read this greeting. I want to thank you sincerely for your invitation to symposium " What does it mean today to be a Christian? The experience of martyrdom Eastern Churches , " which takes place on November 9 in Vienna. Unfortunately, due to earlier arranged commitments I could not come to the event. So I ask Bishop Bohdan Dziurakh , the Secretary of the Synod of Bishops of the Church , to represent me at this symposium and give my greetings to all the participants . First of all, I want to express you, Your Eminence, my deep appreciation for your constant efforts to maintain a dialogue between Eastern and Western Churches, and especially for this event , which, hopefully , will serve to strengthen the faith and inspiration for Christians of Europe. With great joy I found out that this symposium is devoted to the 390th anniversary of passing away of St. Jehoshaphat , one of the greatest saints of Eastern Catholic Churches. My deepest gratitude belongs to you , Eminence, and all your predecessors, who have always been careful guardians of precious relics of St.. Josaphat, when they were in Vienna over the years 1916-1949. This month , on November the 25th , Holy Father Francis and all the bishops of our Church are gathering in Rome to commemorate the 50th anniversary of the transfer of the relics of St.. Josaphat 's to Cathedral of St. Peter , where they were exhibited for public veneration . This was done on November the 22th in 1963 with the will of Pope John XXIII . This act of the Catholic Church not only honored the St.. Josaphat martyrdom for the unity of Christ's Church , but also made ​​him a symbol of fearless professing of faith for all Christ's disciples . St. Josaphat example shows the reason why every authentic witness of faith is also ecumenical by nature. Because someone who lives in a deep relationship with God , can not but suffer from the split of the Church. Blessed martyr Omelian Kovch - who was arrested in a Nazi concentration camp Majdanek because the saved Jews and died there as a witness of faith - wrote to his relatives from this hell on earth: " With the exception of heaven this is the only place where I I wish to be. Here I can see God - God, who is one for all of us . Here we are all equal: Poles , Jews, Ukrainians , Russians. I am the only priest and when I post the Divine Liturgy , they all also pray, each his own language. But did not God understand every language ? " Remembering now St.. Josaphat as a martyr for the unity of the Church, we are now also talking about ecumenism of martyrs and we commend them to restore unity among Christ's disciples . St. Josaphat and thousands of witnesses of faith and martyrs of the twentieth century teach us present Christians a valuable thing how to keep and witness the treasure of faith in our time. In my opinion, today they teach us not to make our fsermon depend on external circumstances , but again and again to fulfill God's will, which is revealed in the Word of God and our calling to be Christ's witnesses . It is true that nowadays confusion and uncertainty dominates in many spheres of life. Many of our contemporaries disoriented and often lose courage and hope today. In such circumstances, we now need to look at our ancestors in faith and learn from them, and use every opportunity to share the joy and hope, which we get from our connection with the risen Christ, with others. On this occasion, the words of Apostle Paul, which he sent to the Christians in Corinth, enter my head,: " Blessed be God and Father of our Lord Jesus Christ , the Father of all mercies and God of all joy, who comforts us in all our grief , so that we can comfort those that are in any affliction with the joy that God comforts us "(2 Cor. 1, 3-4). If we take into account the fact that in the Byzantine tradition the Holy Spirit is called the Comforter (Parakletos), then Christians as the bearers of the Spirit, are called to preach, and to pass contemporary people new hope and new life. In this case we do not need to wait for "better times" to fulfill our own vocation , because every time is suitable for sharing the love of Christ with others! " Now it is the time of grace, now it is the day of salvation! - St. Paul assures us and gives an example as he and his staff became tireless preachers of the Gospel : - We do not give anyone any opportunity to stumble not to expose our ministry to mockery , but we manifest ourselves as servants of God, in great patience, afflictions, in necessities, in distresses, but the blows , in imprisonments, in riots, in labors , in waking , in fastings , in purity , in knowledge , in great patience, in kindness, in the Holy Spirit in sincere love, in the word of truth, by the power of God "( please . 2 Cor. 6, 3-7 ). It is the Spirit of God who gives power to the martyrs of all times and us, who are alive today , for we may be faithful witnesses of Christ in our time. As for this me the words of Archbishop Vladimir Sternyuk, who led our Church underground, seem to me very eloquently. After the fall of communism, a journalist asked him in an interview how he managed to carry out his tasks in the godless days of communism. The old bishop replied obediently, " Actually there is no" godless time "because every time belongs to God. So then we tried to do work of mercy according to our abilities in God's good time. " If our church , like many other churches in Central and Eastern Europe in the last century was granted the grace of martyrdom , this grace should serve all Europe. I am convinced that the sacrificial devotion of the martyrs of the twentieth century to the highest good and their unwavering faith in God's providence can inspire Christians of Europe to display the courage, to go up for the truth and take the path of Christian life in contemporary Europe.
" The memory of them [ martyrs ] can not be lost , because it is a blessing. We display them our surprise and our appreciation : as an icon of the Gospel Beatitudes , which was lived through till the shedding of blood, they are a sign of hope for present and future times. They showed that love is stronger than death ... The martyrs , who are proclaimed to be blessed today, follow the Good Shepherd to the end. Let their witness be no cause for praise , but rather let it be an invitation to follow them ... Not everyone should undergo the highest trial through bloodshed as these two beatific did. However, everyone should follow Christ faithfully in dedication ...I encourage all sons and daughters of the Church to the constant and diligent search for the true and deeper knowledge of Christ ... Let holiness be the desire of all of you , dear brothers and sisters . " None of these martyrs did not taste the fruit of his martyrdom. Few Adherents had the joy of experiencing the revival and return of the underground Church . Taking pleasure in the resurrection of the Church was a privilege of future generations . Today we live in the time of new opportunities , growth and development. And at this time, which is marked by many challenges and oppression , we hear the mighty voice of the martyrs : "Do not be afraid! " Confirm the living Christ and the truth in contemporary Europe! Face the future of Europe with hope and confidence , listen to the voice of God and let the Holy Spirit be in you and act through you ! Live sincerely in faith! Although, perhaps none of you will see the change or taste the fruit of such authentic life, but trust our experience: future generations of European enjoy new prosperity of the Church! This is the "Church of Faith " as our Papa Emeritus Benedict XVI prophetically has written in his book " Faith and Future." "The Church - he says – will flourish again and become the fatherland, which gives them life and hope that goes even beyond death." Your Eminence, dear sisters and brothers in Christ! In this letter I want to assure you , though I am not physically in Vienna, I am united with you spiritually. I wish all participants a fruitful exchange symposium – as for ideas and findings and subsequent actions. I express you my respect for this initiative and say my prayers to God for each participant and church communities that are entrusted to you. Have you always been supported by God with his grace and his blessings !